The story did not end when Queen Grimhilde dance to her death, wearing smoldering hot iron boots. Balance must be met, with one evil gone, another must sprout. Snow White was no longer a young maiden. Sure, she was still hot to trot, but she had a more matured look about her. She still had birds that flocked to her in the forests, but now they were the ravens her mother wish, rather than the bluebirds of her youth. She has become slightly impervious to the cold of the winter, often shunning the latest in winter fashions, for something less stiffing hot. Not that The Prince minded the new look. Her lips were now matched by blood red nails, which no amount of filing would get them back to a more comely length. The only thing that seemed the same was her internal strength. It was still as strong as a rose. Little did she know that the many changes to her person were brought on by a ring, inherited with her new title of Queen. The Ring was once the same one which originally carried the poison. The very poison that her stepmother had used upon her. The black magic was still within, using the kernel of a seed, a seed of evil, lodged deep within her person. Twisting and turning her rose like strength into a gnarled mass of deadly thorns. Only time will tell how the rest of this tale plays, you have 7 days to wait, to discover your own enchanted ending. There is a new themed, quarterly event on its way. Enchantment is inspired by the original Grimms’ Fairy Tales. The first theme if you hadn’t guessed is their 53rd story, Snow White. 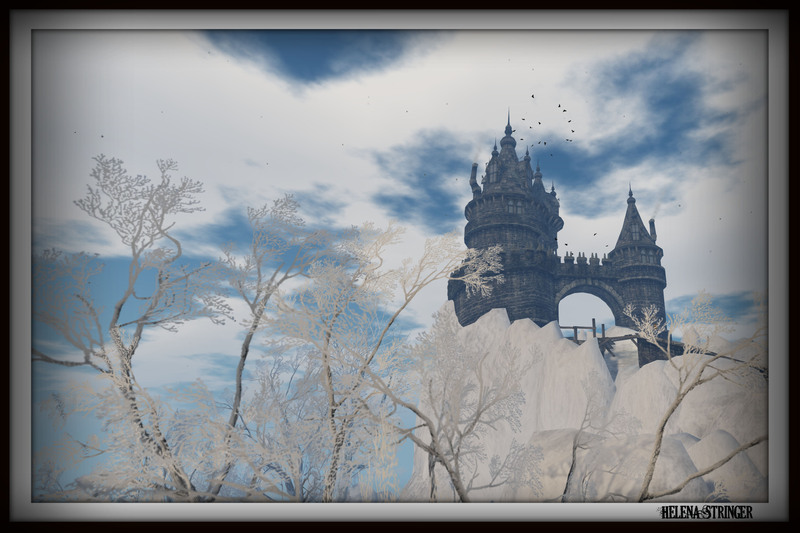 November 1st marks the date for the golden gates to be opened, allowing all manners of people and fairy tale creatures, to come explore the enchanted lands. All items at the event are Limited Editions, never to be released again, after the event. There has been a lot of thought and time put into each item, each inspired by the theme, and a true sense of the original fairy tales. I’ll give you a little tip, join the inworld group(more info HERE) and you will be able to get on the sim 12 hours before the general public. Think of what mischief you could get yourself into with 7 dwarves in 12 hours?